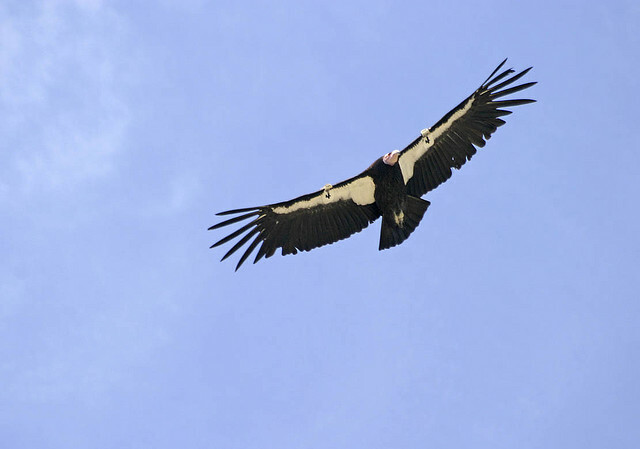 GPS transmitter info shows two condors flew over the lookout and Huff's Hole yesterday - condors 449 and 526, flew north along the Lopez ridge, and then returned to south to the upper Sisquoc area. Hopefully we see more of these forays into their old haunts! Thank-you to all the staff, volunteers, field trip leaders and evening presenters for making the open house event a success, and to the two girl scout troops conducting a service project removing invasive yellow-star thistle. More than 70 adults and kids attended, including a good turnout for the birding and native plant identification field trips. The fundraising auction and merchandise sales generated more than $700 for the project's operating expenses and internship support. Those who stayed on throughout the evening enjoyed the complimentary wine tasting by Saucelito Canyon winery, evening potluck dinner (and Jim's famous upside down cake for dessert!) and PowerPoint presentations by our guest speakers. Come and discover one of the largest and most endangered flying birds of North America. California Condors are radio tracked from Hi Mountain Lookout. This is an opportunity for you to learn more about condor biology and the reintroduction of these magnificent birds back to the wild. The open house event will include condor radio-tracking demonstrations, native plant identification, bird watching field trips, and hands-on activities for kids.